You never forget your first love. Mine was English history. At the age of 12 and living in Cleveland, Ohio, I knew it well enough to name every English ruler back to Edward the Confessor. As an adult, I eventually moved beyond my childish fondness for England for a grown up passion for the Byzantines. Imagine my surprise when I realized that these two civilizations – so distant from one another – impacted each other in important ways in the 11th century. They also saw pivotal battles whose consequences are felt even today. The pivotal battles were, of course, the Battle of Hastings in 1066 and the Battle of Manzikert five years later in 1071. William the Conqueror’s descendants still sit on the English throne, while the Seljuk Turks’ win at Manzikert started a process that their Ottoman cousins completed in 1453. Harold Hardrada was probably the most important individual to impact both the English and the Byzantines in the 11th century. Harold was forced into exile when Cnut the Great, King of England, Denmark and Norway, defeated him and his brother. Harold eventually travelled to Miklagaard (the Norse name for Constantinople) and spent eight years in the elite Varangian guard. He served the Byzantine throne during many of the turbulent years of the reign of Empress Zoe before returning to Norway in 1042 with enough wealth to take its crown for himself. In 1066, after Harold Godwinson was chosen to succeed Edward the Confessor, Hardrada was convinced to throw his support to Godwinson’s brother and rival, Tostig. Godwinson defeated and killed Hardrada at the Battle of Stamford Bridge. However, the Anglo-Saxon forces were then so weakened that Harold Godwinson lost his final battle at Hastings to William of Normandy a few days later. Harold Godwinson had a number of children survive him. One of them was a daughter, Gytha, who later married Vladimir II Monomakh, Grand Prince of Kievan Rus. 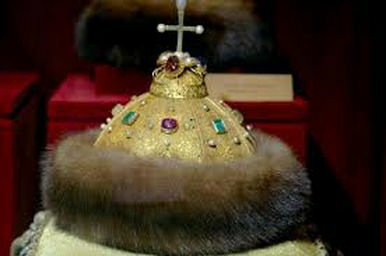 Vladimir’s maternal grandfather was Constantine IX Monomachus, the third and final husband of Empress Zoe. It’s hard to imagine the shock the poor girl must have felt on being sent off to a barely beyond barbarian stage Rus prince from the magnificent city of Constantinople. Monomachus sent her off with an Imperial crown, a photograph of which is above. Finally, the Battle of Hastings left more than a few Anglo-Saxon warriors with limited career opportunities in England. Many of them ended up in the Varangian guard – well compensated for their efforts and away from the Conqueror. This wasn’t the last interaction between Byzantines and the English. There is a Theodore Palaeologos, descendent of the last Byzantine dynasty and a Roundhead during the English Civil War, buried in Westminster Abbey, but that was 500 years after these events. PrevPreviousThings the Byzantines have taught me.